A car’s transmission carries out the function of sending power from the engine to the wheels. Generally, if maintained properly, during the hot summers or the freezing Chicago winters, a good transmission will last up to 100,000 miles. When not serviced or properly maintained, the transmission could break down, and you could incur high transmission repair costs. Dirty transmission fluid or low fluid levels are the main causes of transmission problems. Dirty transmission fluid can be checked by looking at the fluid, provided you know the difference between bad fluid and healthy fluid. Heat is a major enemy of transmissions. The level of the fluid should be checked every month or so, as low levels can cause the car to overheat. Transmission fluid should be changed every 15,000 miles or once a year—whichever comes first. Synthetic fluids are gaining popularity because they perform better than ordinary fluids. They have more resistance to oxidation, cold, heat and shearing, all of which are responsible for shortening the life of the transmission in normal working conditions. Servicing the transmission includes changing the filter, cleaning the transmission pan and draining the old fluid. After that, new fluid is put in and the parts are assembled back together. This is the best and lowest-price preventive measure that you can take for the health of your transmission, and it should be done every two years or 30,000 miles. Stop the car completely before shifting from reverse to drive. This will ensure that there is no sudden jerk to the transmission. Don’t drive the car with your foot on the brake. This adds additional strain to the transmission. Keep your engine accurately tuned. A healthy engine compliments the transmission in running smoothly. Add an external filter. This will trap more contaminants and dirt, and prolong the life of the transmission. Drive your car slowly after a cold start. The transmission takes about 2 to 3 miles of driving before it has warmed up. Use the emergency brake when parking on an inclined surface. This will give additional support to the transmission to hold the weight of your vehicle. Avoid resting your hands on the gear level. An accidental jerk of the hand when the car is in motion can cause sudden strain to the vehicle. Since heat is bad for the transmission, the car’s radiator serves the function of cooling it. Therefore, it is important to maintain the accurate functioning of the radiator and the entire cooling system. As a rule of thumb, it’s important to have cooling system maintenance performed every 2 years. Maintenance should include checking the coolant levels, replacing the antifreeze, inspecting for damage and leaks, thermostat check, radiator cap pressure test and the inspection of belts and hoses. Are you Looking for Professional Transmission Repair or Maintenance in Chicago? Are you getting your transmission maintenance done regularly? In need of professional transmission repair or maintenance in Chicago? If so, King Transmission is the company to call. We can help you develop a car maintenance schedule so that your automobile does not experience any unexpected mechanical problems. 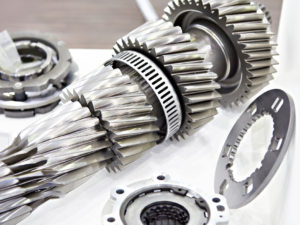 At King Transmission, we have certified and highly skilled technicians who are well-versed in the maintenance and repair of all types of transmissions. We can help you regardless of the make and model of your vehicle.